After 4 months of in-orbit commissioning, Jason-2 has entered the operational phase of its mission. The new ocean-observing satellite offers many improvements compared to its predecessor Jason-1. Jason-2 has been in orbit since 20 June. It is now trailing Jason-1, from which it is set to take over for at least the next 5 years. Like its predecessor, the new satellite uses a radar altimeter to measure signals reflected by the oceans. 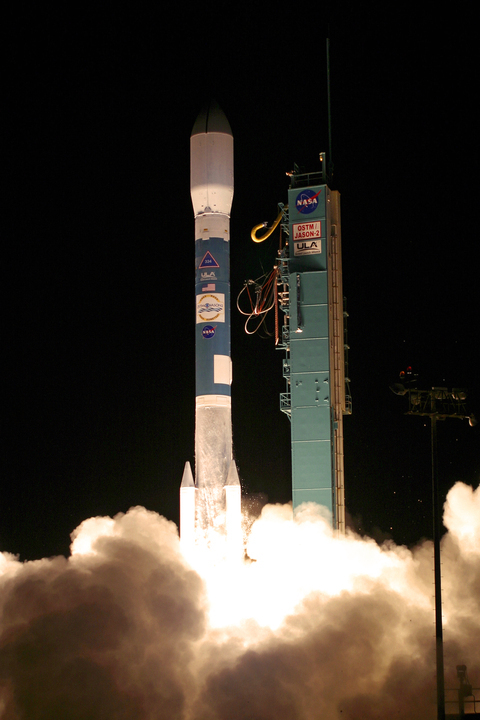 Jason-2 climbs into orbit atop a Delta II launcher on 20 June 2008. Credits: NASA. Jason-2 is capable of measuring sea-surface height with an absolute accuracy of 3 to 4 cm, as well as wave height and wind speed. One of its science objectives is to extend the continuous data record of sea-surface heights to 20 years.créer raccourci It will accomplish this mission by flying over exactly the same ground track as Topex/Poseidon (1992-2003) and Jason-1 (launched in 2001), only with much-improved measurement precision. Jason-2 is flying in tandem with Jason-1 to allow engineers to calibrate its instruments. Credits: CNES. Wednesday 29 October, the development team officially handed over to operations teams at CNES, NOAA1, NASA and Eumetsat2. Jason-2 command and control centre at CNES’s space centre in Toulouse. Credits: CNES. The teams will now keep the satellite running smoothly throughout its mission, performing routine operations, processing data from ground stations in near-real time, and archiving and distributing operational products, like near-real-time ocean bulletins, and other vital information for decision-makers. 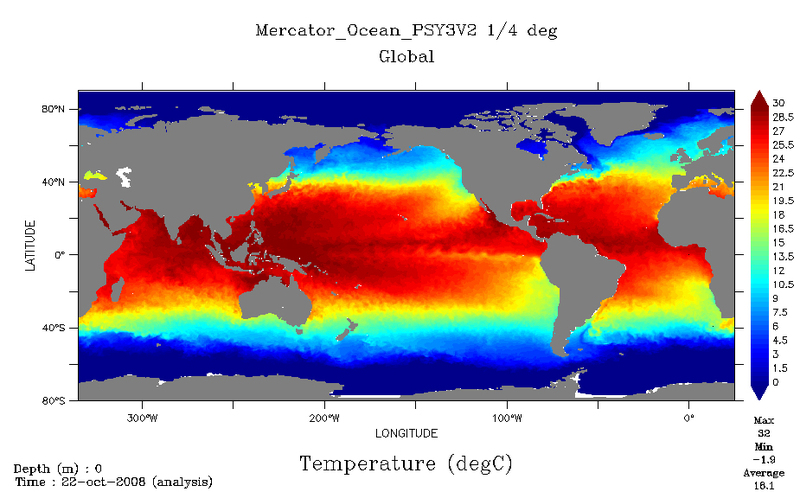 Mercator ocean temperature bulletin for 22 October to 4 November 2008. Credits: Mercator Ocean. The agency will be pressed into action if the satellite goes into safe mode in the event that an anomaly is detected in one of its systems. Above all, it will process and deliver high-precision science products, used for example to refine ocean forecasting models like Mercator.